Though she sees “such black and grained spots” in her “very soul,” Nichols’ Gertrude is not admitting to any guilt or even lack of judgment; she’s overwhelmed with emotional pain made worse by the salt her son keeps rubbing and rubbing into her wounded soul. A Midsummer Night's Dream: O Loving Hate! On the same day we saw New York’s most revered Shakespearean institute, the 50-year- old Shakespeare in the Park, play As You Like It, we took in the 3-year-old Shakespeare Forum’s first-ever production, Hamlet. The former offered a straight reading of the play but made an awkward attempt to do something new with its most popular character (further discussed in my review of that play). The Shakespeare Forum took a few liberties with Shakespeare’s script yet unveiled emotional layers in the text and revealed one of The Bard’s most difficult-to-respect characters as a truly rich portrait. The Player King (Claire Warden) carries the Player Queen (Dan De Jesus) onto the stage as the Elsinore court watches. From left are Guildenstern, Rosencrantz, Polonius, Gertrude, Claudius, Ophelia, Hamlet, and Horatio. Photo courtesy of The Shakespeare Forum. That character is Gertrude, Hamlet’s mother and queen of Denmark. Through 11 stage performances, a half dozen movie versions, and countless readings of this play, I have long considered the women in Hamlet to lack much substance, especially compared to Shakespeare’s usual portraits of women. Ophelia, in capable hands, can be intriguing if the actress balances the girl’s fortitude at the start with her madness in the end and believably works through the pivotal nunnery scene in the middle—no easy task, but I’ve seen it done. Gertrude, however, even in the most capable hands, comes across as shallow and contradictory. Shakespeare didn’t seem to be sure himself of how he wanted this queen presented: if she was complicit in Claudius’ plot, if she believed Hamlet’s assertions, if she really wanted her son to marry Ophelia, if she had half a brain. I guess I simply have never seen hands as capable as those of Andrus Nichols, who plays Gertrude in this Shakespeare Forum production; and I lack the insight of director Sybille Bruun Moss. The Shakespeare Forum, founded by Bruun Moss and her husband, Tyler Moss, is a consortium of actors, directors, and Shakespeare lovers finding comradeship and enlightenment in like-minded fellows. The organization provides open workshops every Tuesday evening for people to work, watch others work, network, learn about Shakespearean stagecraft, and “develop new tools to use in life and in theater,” Moss said. The Shakespeare Forum also conducts private master classes and is pursuing a teaching program with public schools. Meantime, it set out to produce its first public presentation with Hamlet, and it gathered an outstanding cast of 12 actors, seven of them Equity members, for the purpose. Bruun Moss shapes this Hamlet as a play of interpersonal relationships rather than political intrigue. She not only cuts out Fortinbras entirely (except for Claudius’s dealing with the Norwegian threat in the court scenes), she drops Shakespeare’s first scene, that of the Ghost appearing to Horatio, Barnardo, and Marcellus on the Elsinore battlements. This choice goes beyond the practical benefit of ridding the two sentries (as well as Francisco) from the cast list, for in its place Bruun Moss shows us Hamlet—and in the background Gertrude and Claudius—receiving notice of the elder Hamlet’s death. Horatio brings the news to Hamlet, who collapses in his best friend’s arms, a tableau mirrored at play’s end. Hamlet’s world literally shifts out from under him as he receives the news, and the aftershocks keep coming: His uncle becomes king, his mother marries his uncle, his father’s ghost appears, and that ghost tells him his uncle murdered him. Thereafter, the psychological temblors that hit Elsinore are caused by Hamlet: His “antic disposition” that concerns the court so much, his abuse of Ophelia, his staging the mousetrap, and his killing Polonius, all of which lead to the concluding Armageddon. The black hole in one human swallows the rest. In modern dress and on a bare stage with white curtains as a backdrop, this Hamlet uses the characters themselves as its canvas. Most important are the three kin at the center. Tyler Moss plays the titular character with no shadings beyond what Shakespeare gives him: obviously smart, obviously depressed even before seeing the ghost, obviously bewildered by the ghost’s charge, his emotions range over a wide spectrum in reaction to everybody—father’s ghost, supposed friends, girlfriend and her father and brother—who try to play him to their own compositions. Moss is to Hamlet what a pianist is to Beethoven’s Fifth Piano Concerto, in perfect concert with the rest of the cast in the ensemble passages, but tackling his solo parts with a virtuoso’s touch that give unique expression to the score written for him. Moss’s soliloquies are a treat, especially “To be or not to be,” which he delivers by sitting in the audience, first talking with a woman next to him and then expanding his delivery to the rest of us. Sure, some people need to turn around to watch him, but it is like the insightful student sitting several rows back in the lecture hall offering a brilliant counterpoint to the professor. Who doesn’t turn around and watch in admiration? Tom O’Keefe plays Claudius as a gregarious man, constantly seeking to please and be loved. He’s openly affectionate with Gertrude and overly affectionate with his stepson, causing Moss’s Hamlet, as he starts his “O, that this too too solid flesh would melt” soliloquy, to physically shake off from his person his uncle’s departing hug. This most sociable and loving guy simply has a pathological streak in him when it comes to desiring his brother’s crown and wife and, after killing his brother, keeping crown and wife. Not knowing any of this, Gertrude could easily fall for her first husband’s affectionate kid brother. In Bruun Moss’s first scene, when Gertrude gets word of her husband’s death she turns toward her brother-in-law across the back of the stage. Is the sexual relationship there already? Or is it Gertrude’s shock at the sudden loss that we see, and her need for someone to lean on? It’s hard to tell here (and this being extra-Shakespearian, it really doesn’t matter). Obviously, though, Nichols’ Gertrude is in love with Claudius as the play proper starts, and she dotes on her son, too. So much of her actions are driven by her care for Hamlet. For example, she responds to the reading of his letter to Ophelia with a war of feelings, the maternal protectoress versus the woman who genuinely likes the object of her son’s apparent affections. In Nichols’ playing, the complexity of this character is more in what she doesn’t say than says, and this she plays out brilliantly in the closet scene. This woman is already irritated with her son’s bizarre staging of a play that angers her husband when that son storms in on her, becomes physically abusive, and then kills Polonius right in front of her. Even as Hamlet continues to rail at Gertrude, the dead body is still right there, and Nichols keeps glancing at it. Then Hamlet uses pictures to compare her first husband with her second, denigrating her current love as he does so. “You cannot call it love, for at your age the heyday in the blood is tame, it’s humble, and waits upon the judgment,” he tells her. What a nasty thing to say (even in Elizabethan times) to a woman who is, perhaps, 50 and who may still be mourning the sudden death of her first husband but yet loves, as much, her current husband. “O, speak to me no more,” she pleads, repeatedly. “These words like daggers enter in mine ears.” Though she sees “such black and grained spots” in her “very soul,” Nichols’ Gertrude is not admitting to any guilt or even lack of judgment; she’s overwhelmed with emotional pain made worse by the salt her son keeps rubbing and rubbing into her wounded soul. And then, that son sees his father’s ghost. Gertrude doesn’t, and Nichols has her grappling with the clear evidence that Hamlet really is insane. It’s a heart-wrenching moment, as Gertrude glances in threefold helplessness from son to Polonius’ body and to vacant space occupied by the ghost. In true Shakespearean convention, she thereafter agrees with everything Hamlet says because of his insanity, not because she believes what he says (I owe this observation to Jeff Watkins of the Atlanta Shakespeare Tavern). In this performance I also realized how Shakespeare cleverly crafts the turn of events so that the next time we see Gertrude she is resisting seeing the insane Ophelia and then begrudgingly granting her audience. Nichols’ Gertrude simply can’t abide insanity, but she also has foreboding. “Each toy seems prologue to some great amiss,” she says before Ophelia enters. The queen here is bending to life’s overwhelming forces, and thus in the final scene she may or may not know she’s drinking poison; in this performance, we suspect she’s fully aware of what might be in the cup. 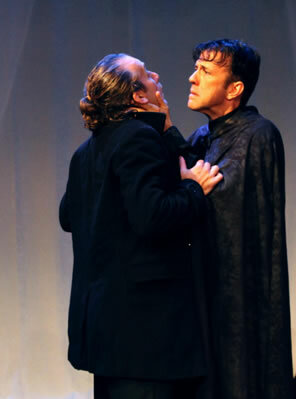 Hamlet (Tyler Moss), left, encounters his father's ghost (Pat Dwyer) in The Shakespeare Forum's production of Hamlet. Photo courtesy of The Shakespeare Forum. Ophelia, smartly played by Erin Keskeny, is broken by life’s overwhelming forces: her one-time lover—who turned inexplicably monster on her—killed her father, and with her brother gone she's helpless. Keskeny’s Ophelia starts out as a happy, romantic girl, but all the men in her life seem obsessed with her virginity, much more so than she is. It’s amusing to her when Laertes (Brian Smolin) mentions it; it’s annoying when Polonius (Christopher Seiler) brings it up; it’s frightening when Hamlet makes it the object of his rage. No wonder that in her insanity she is preoccupied with violated chastity. In this solid company of players, a few other portrayals add rich depth to this great text. Seiler deftly balances the clownish nature of Polonius with his role as trusted advisor and respected father. Sociable himself, he is drawn in by the king’s gregariousness to become so familiar with the royal couple that he falls victim to, as Hamlet says, being “too busy.” James Patrick Nelson is a steady Horatio, not only the kind of true friend Hamlet innately trusts but the kind of person whom Shakespeare assigns to be Ophelia’s caretaker (a fact I previously overlooked in my assessment of this character until I saw Nelson’s Horatio tenderly manage the wracked girl). Interestingly, this Horatio seems to have a suspicious regard of Claudius from the start; his reading of “Indeed, my lord, it followed hard upon” reveals a deeper understanding than Hamlet has of the king’s overhasty marriage to Gertrude. As for Hamlet’s other childhood friends, Dylan Kammerer, in contrast to Adam Goodman’s Rosencrantz (and to his own playing of the meek but persnickety Reynaldo), portrays Guildenstern as a man with an overly elevated self-esteem. He becomes clearly annoyed when Claudius mistakes him for Rosencrantz, and in the pipe-playing scene this Guildenstern is ready to visit physical violence upon Hamlet. It would have added spice to Hamlet’s sending him to his death, except that Bruun Moss cut from the script Rosencrantz and Guildenstern’s fate. That is but one victim of her trims and conflations of the text. Another is the fusing of the Claudius-Laertes scenes in the fourth act into one continuous scene, a confusing compression of time that removes the context from their plotting out Hamlet’s assassination. The mousetrap is a performance-art rendition of the dumb show that somehow casts a spell on the courtly audience and ends with Claudius himself pouring poison in Hamlet’s ear (interesting to watch, but difficult to decipher). Earlier, when Hamlet and Ophelia meet at the start of the nunnery scene, they are fully affectionate with each other, kissing and cooing. But then she hands him his letter. This sudden change in Ophelia lacks reason, except, in that it does lack reason, it may justify Hamlet’s turn to rage. But we get a nice moment later when Hamlet is reading the returned letter as Polonius asks what he reads. “Words, words, words,” Hamlet says, each “words” more despondent than the previous as he looks upon his foiled entreaties of love. All of these cuts, conflations, and choices (and the addition of that new first scene) Bruun Moss does in the service of her take on Hamlet as more than merely the most famous literary work of all time. The play is also a universal portrayal of humanity in desperate straits, when unconditional love fails us and fails those we unconditionally love, when life lays one fardel too many upon us. Hamlet is a multi-layered piece of work; Bruun Moss and The Shakespeare Forum cast have successfully reached into one of its deepest layers.